Your gut’s GPS navigation says take a right turn onto the superhighway to better health by increasing your gut microbiota (i.e. bacteria) diversity. 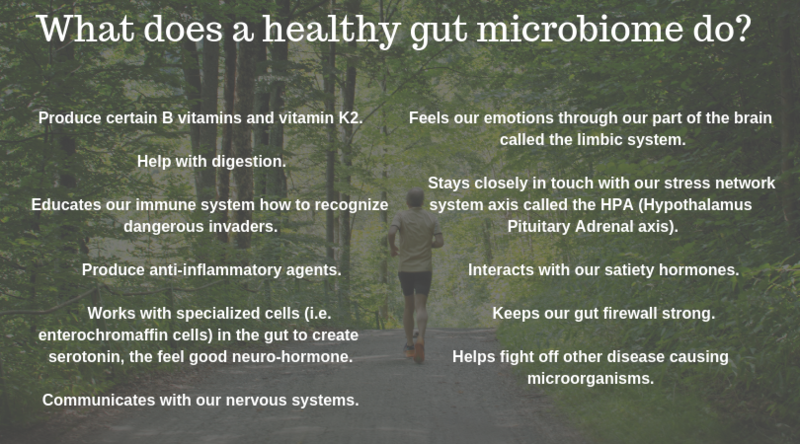 The bacteria that make up our gut microbiome constitute 1-3 % of our body weight. On average, a 200 lb. man has roughly 2-6 lbs. of bacteria. If that sounds creepy, it’s not. The bacteria are generally not harmful to us. Instead, they live in symbiosis with us. The bacteria found in our body have 1,000 more genes than our human genome. That’s a lot more DNA to do a lot more “programming” to our metabolism than we ever imagined! 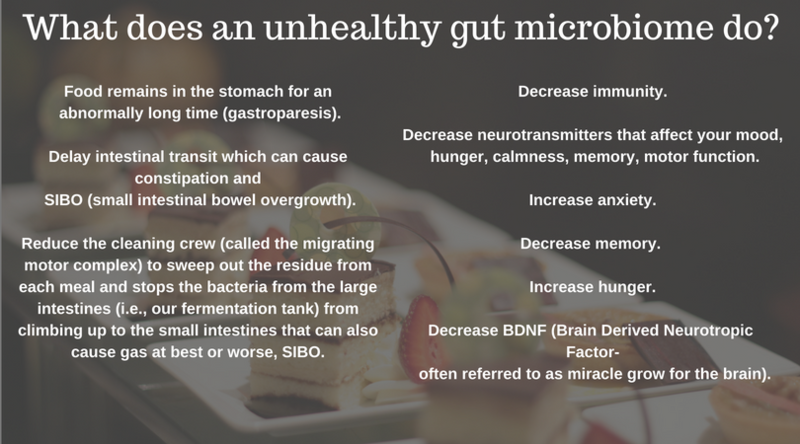 And since the lion’s share of our microbiome lies in our gut, we can learn many ways to make mindful choices with our fork, the medicines we take and our lifestyle to sustain our gut microbiota diversity. Around 2008, two population-scale projects were launched to study what really constitutes a “healthy” human microbiome, the Metagenomes of the Human Intestinal Tract (MetaHIT) study and the Human Microbiome Project (HMP). Together, both projects have sequenced the gut microbiome’s DNA from over 2,000 healthy individuals spanning multiple continents. The findings: within a “healthy” gut microbiome, over 1,000 bacterial species were identified of which each of the 2,000 people carried about 160 species composed of about 8 families or phyla. This was all done by stool testing along with DNA sequencing. From these findings the gut microbiota diversity, a scientifically accepted measure of the number of different bacteria present and their relative abundance, has become a marker of health. We now have a Shannon index that measures your gut microbiota diversity by a stool test with DNA sequencing. A low diversity index (between 1-4) is not where you want your needle to be. A low index may be the result of frequent antibiotic, anti-acids, or NSAIDS, alcohol binge drinking, eating the same thing day in and day out, not eating enough fiber, too much stress or overwhelm, trauma, illness, or you are old and have a monotonous diet. These microbes can be our BFF for good health if you have a high index (between 4-8). Studies in germ-free mice, where research scientists purposely wipe out the rodents’ gut microbiome, have many health problems. When scientists put back all of the bacteria all of the health issues are restored, but in an age-dependent manner. This is really important, especially if you are not young. What these studies highlight, however, is that when you are older you can’t just tear down your gut flora, and hope to repopulate with a few pills and everything is fine. Perhaps if you are young you may be able to get away with it. But when you are older it becomes harder to rebuild it. Human clinical studies show when you don’t have the diversity of the strains of bacteria down there, you will see more asthma, allergies, skin conditions, type 2 diabetes and even obesity. With the microbiome health benefits heating up don’t be surprised one day soon when you go to your doctor for your annual wellness exam and he or she hands you a stool bag for sampling. Most functional medicine practitioners are already performing this lab test as an annual wellness screen. In fact, since many chronic health issues start at the gut level, so often a functional medicine practitioner will begin digging into the root issue of your problem with the 5-R program. Seeding your gut with probiotic foods is a great way to induce a modified health response; however, what we want to remember is to find ways to keep our colonized bacteria well fed with sufficient fiber and pre-biotic foods so that the bacteria stay around and give us all of the health benefits (Chart 1 above). The absolute best way to increase diversity is to increase dietary variability. A simple intervention may be to track your fiber intake via various apps. Personally, I challenge myself weekly to use Toribio-Mateas Method of using 50 fresh bright colored foods in a week. Even herbs and spices count. I’m a big advocate of making whole food smoothies each day in order to accomplish this task. Ask me for some of my whole food smoothie recipes. I’ll be happy to post many of these on Dorignac’s Facebook Page. I’m in my kitchen conjuring up my next Gut Microbiome Diversity recipe, so stay tuned. PS: Come visit me during Dorignac’s Customer Appreciation Week on October 5th. I wish I was there to see you. I live in Greenville Sc now. Hope you have a great week.